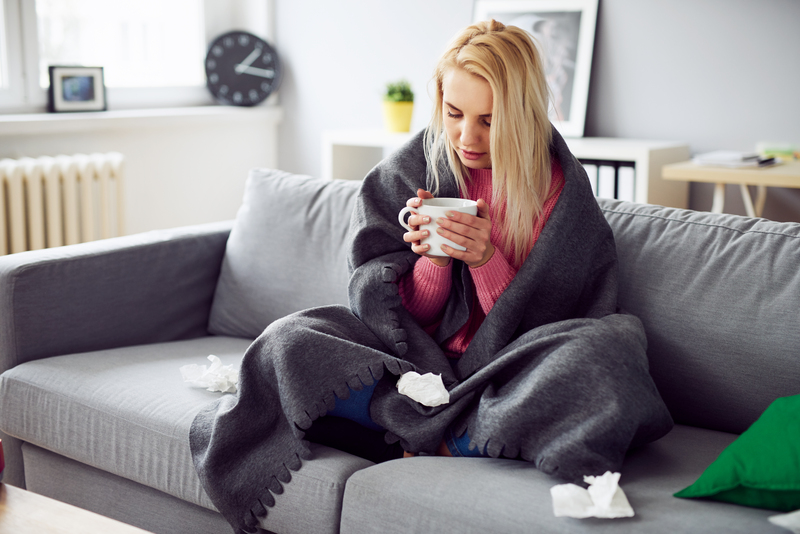 Though there is no fool-proof way to avoid the common cold (usually caused by the rhinovirus), there are things we can do to strengthen our immune systems and improve our chances of self-defence! Here are my top five tips to help you stay happy & healthy this winter! Sleep really does help when it comes to fighting off illness. Conserving energy allows the immune system to focus inwards and fight off any lurking virus or bacteria. Aim for about 7-9 hours sleep per night, or slightly more if you feel you may be at the onset of a cold or flu. Increasing your water intake is one of the cheapest, easiest and most effective ways to improve your overall health! Keeping your mucous membranes moist will enable the nasties to pass through without taking hold and making you sick! It will also ensure that nutrients can reach your cells and do their thing to keep you well and healthy. Aim for about 1-2 litres of pure water per day! If you feel that this is unachievable in the colder months, try hot water with lemon or herbal tea for a more comforting alternative. Staying active all year round will keep you strong as well as delivering fresh blood to the tissues, which helps to support your overall immunity. Again, this is an amazingly simple and cost effective way to boost your overall health. Moderate exercise such as brisk walking for 45 minutes per day may be all you need to reap the rewards. Consistency is key, and it has been found that brisk walking for 45 minutes 5 times a week can reduce your chances of developing a cold by a third! Maintain a healthy diet! A diet lacking proper nutrition is likely to result in more frequent illness. So, here is another plug for a whole-food diet rich in whole grains, brightly coloured fruits and vegetables and all of those good fats that we keep banging on about. Fermented foods such as yoghurt, tempeh and sauerkraut to provide the body with probiotics. Probiotics are good bacteria, which help to balance a healthy immune system. They actively destroy pathogens and fight bad bacteria. Which leads on nicely to my next tip….. It is commonly argued that a diet rich in nutrients consumed by a healthy individual will not require any additional supplementation. However, due our modern lifestyle, overconsumption of caffeine, high stress levels and a reduction of nutrients found in the soils, we may want to consider on-going supplementation. It has been suggested that most of us are deficient in vitamin D. This reduced status can be partially responsible for increased frequency of illness. Most vitamin D is synthesised by the body when large areas of skin (legs, backs and arms) are exposed to the sun for at least 30 minutes per day. So, even with a beautiful summer like the one we just had, many of us will still fail to reach this level. I recommend supplementing with a sublingual (under the tongue) spray for optimum results. It has been found that oral zinc helps to prevent and reduce the length of colds. Taking at least 200 mg of vitamin C per day appears to reduce the duration of cold symptoms by an average of 8% in adults and 14% in children. Elderberry may even have the ability to block the flu virus! Quite a claim but worth a try. The typical dose is 1-2 teaspoons per day for prevention and 1 teaspoon every 2-3 hours if fighting a virus, safe for children as well. A cup of hot water with lemon, ginger and honey may be the best thing to help fight the symptoms of a cold. The honey offers antibacterial qualities and soothes the throat, while the lemon provides a cleansing dose of vitamin C and further adds to the antimicrobial properties of ginger. White, green and black teas all deliver disease-fighting polyphenols and flavonoids. These antioxidants actively find the free radicals and destroy them. Caffeinated and decaf work equally well. Great news for the caffeine lovers! Probiotics can be taken in supplement form, best as a powder, but there are plenty of food sources of probiotics as well! Greek yogurt, sauerkraut, dark chocolate, and pickles just to name a few. Best taken at first signs and symptoms of a cold, Echinacea can reduce the length and severity of an illness. It is a flowering plant that research shows increases the number of white blood cells in the body, which fight infections. However, it is worth mentioning that it has been found to interact with certain medication, so please consult your health care professional prior to use. ← How can osteopathy help during pregnancy?